Chamaerops humilis, Fan Palm This palm is native to Portugal. Indeed it is the northernmost naturally occurring palm in the world. 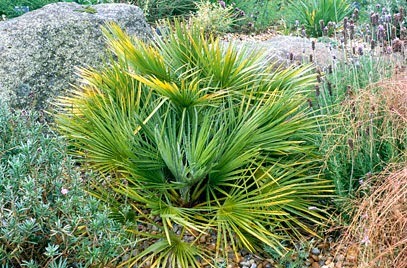 This shrub-like clumping palm grows slowly to a mature height of 2 to 5m. It is totally drought tolerant and will survive short periods below freezing. It is also one of the few species palms so far found to be mostly resistant to the red palm weevil which is devastating many of the exotic palm species imported from north Africa, especially the Phoenix canariensis. Humilis is derived from Latin humus (on the ground, low) meaning ‘low-growing or lower growing than most of its kind’ and also denotes humility. Fibre from the leaves has been used for making rope and brushes. Known as ‘Algerian fibre’ or crin végétale it used also to be a major export commodity for the Algerians, when it was in demand as stuffing for mattresses and furniture. Difficult to imagine this when you see the spines along the leaf stems ! Locally the young leaf buds have been eaten as a vegetable. Authorities believe it was introduced to Britain in 1731.